Since blogging about fly etchings on the Amsterdam airport urinals, reports of similar “nudging” porcelain fixtures have trickled in. There are lots of unconfirmed reports of these urinals in the Munich airport, a Burger King in the center of Amsterdam, throughout Holland, and in the Detroit airport. 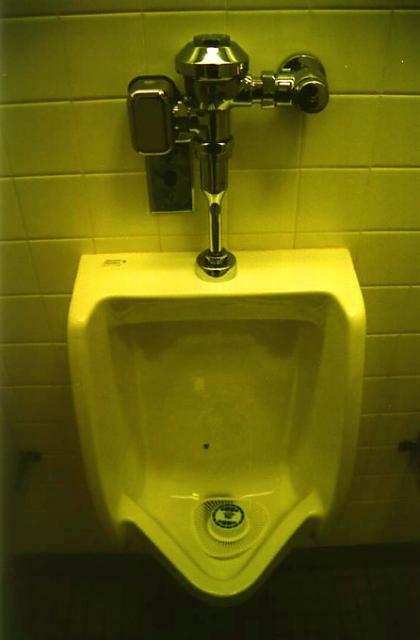 There are also unconfirmed reports that Purdue University, the University of Colorado, Broward Community College, and an unnamed college have installed these kinds of urinals with bees instead of flies. If you’d like, you can buy your own urinal fly. 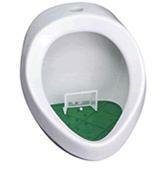 And then there is something called pee goal (that may be in Germany?) that ties a small ball to a thread and lets guys move it toward the goal. It doesn’t look like this will reduce spillage at all. The strategic placement of a bee image on the urinal reflects that someone is a bit of a punster. Latin for bee is apis (yeah, say it aloud). A bee colony is an apiary. Nice play on words. I guess they could also (in the same vein) paint bulls on the urinals since Apis is a sacred bull worshipped by the ancient Egyptians. But of course in this day of political correctness, any remnants of that bull-worshipping crowd may take offense at their object of worship being peed upon. I would like to buy the pee goal thing. But I dont know where! Im from Argentina and its an Irish pub here named Wilkenny where I work and they want to put them. If you know where can we get them please answer.